Gianna Rao came a mere 14 inches from breaking a 17-year-old record in the hammer on Saturday. 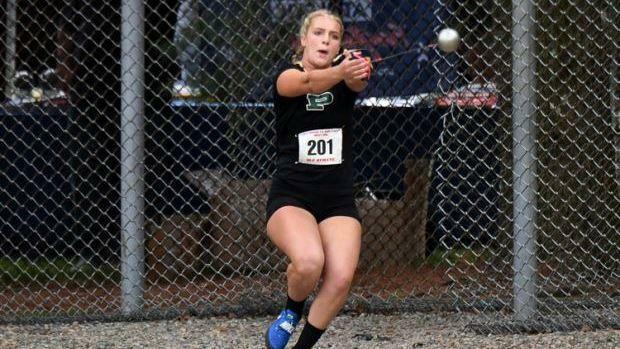 The Ponaganset senior won her specialty at the annual Brian Moretti Invitational with a personal best of 188 feet, 1 inch. Once again, Rao was pushed to the limited by Barrington's Annika Kelly. The talented junior, who last week at the Classical Classic exceeded 170 feet for the first time, improved on her best by five feet with a heave of 178-10. Rao and Kelly currently rank No. 4 and No. 5 in the country. Lincoln's Kyle Moison joined the 200-foot club with a PB and winning toss of 204-9 in the Boys' hammer. La Salle's Cameron Crose was second at 196-0. North Kingstown's Andrew Whitney was a multiple winner in the meet, held at Westerly High. The Skipper senior captured both sprint events, winning the 100-meter dash with a time of 10.89 seconds and breaking the tape in the 200m at 22.21. 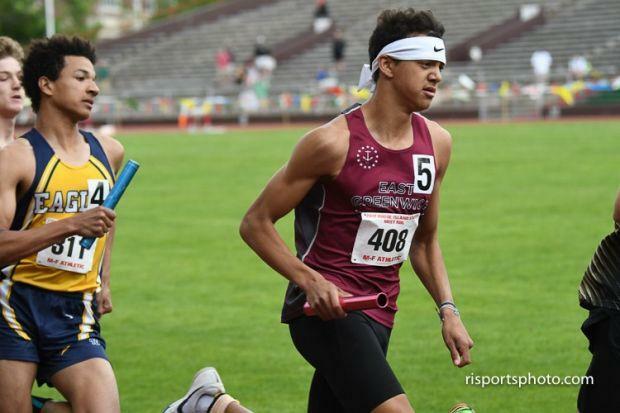 He also ran a leg on his team's first-place 4x100m relay squad of Edward Cardarelli, Zachary Pezza and Dante Echeandia that was timed in 43.05. East Greenwich teammates Cebastian Gentil and Colin Cianciolo finished 1-2 in the 800m. Gentil clocked a state-leading and meet-record time of 1:54.24. Cianciolo crossed the line in 1:56.51. A total of seven dipped under two minutes! The host Bulldogs garnered a few impressive performances. In the 1,500m, senior Randi Burr was a convincing winner. taking gold with a time of 4:43.90, nearly 11 seconds ahead of La Salle's Emily Kane (second, 4:54.77). Sophomore Sydney Federico claimed the 400m crown with a time of 59.21. Westerly also swept all three relays - 4x100m (50.15), 4x400m (4:07.35) and 4x800m (9:55.65). The Prout School's Sarah Mitchell came less than a foot from a 40-foot mark in the shot with her toss of 39-4. Hendricken Sean Meehan was first in the 1,500m, outdistancing runner-up Quentin Viera of East Greenwich by two seconds with a time of 4:03.50. Viera finished at 4:05.55. East Greenwich's Jeffrey Pedersen dominated the 3,000m with a time of 8:46.80.